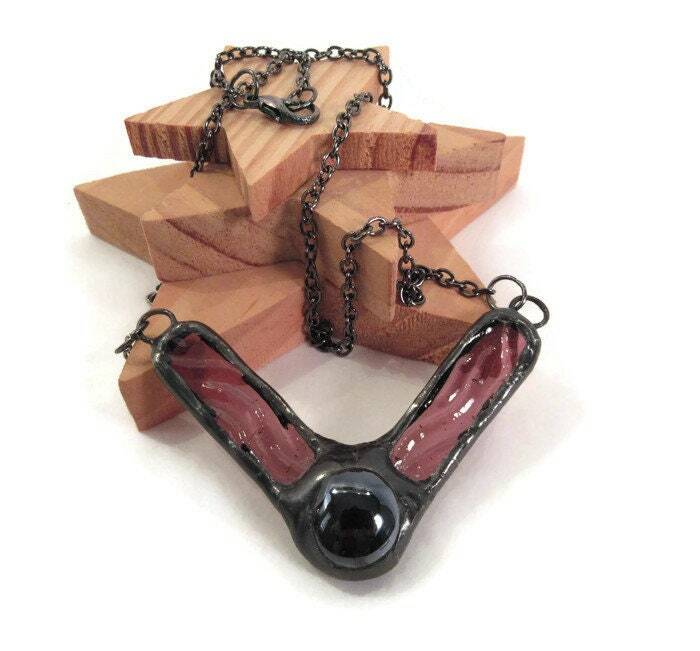 Purple Vee Necklace has a deep purple glass nugget at the center of two deep purple rectangles of a beautiful ridged stained glass, a unique statement piece. All edges have been wrapped in copper foil and given a thick layer of lead free solder, after assembly the necklace is given a dark patina and then waxed and polished to a shine. It is then hung on a 22 inch (56 cm ) gunmetal coloured link chain with a lobster clasp. This pretty Vee Pendant comes in a handmade fleece gift bag that is ready for gift giving or safe keeping.